The Bureau of Labor Statistics calculates official price indexes for two population groups. One is the Consumer Price Index for All Urban Consumers (CPI-U), which represents the spending habits of about 88 percent of the population of the United States. The other is the CPI for Urban Wage Earners and Clerical Workers (CPI-W), a subset of the CPI-U population, which represents about 29 percent of the U.S. population. BLS also calculates an experimental CPI for the elderly, or CPI-E, by using households whose reference person or spouse is 62 years of age or older. In 2009–2010, approximately 24 percent of all consumer units met the CPI-E's definition of having a reference person or spouse 62 years of age or older. From December 1982 through December 2011, the all-items CPI-E rose at an annual average rate of 3.1 percent, compared with increases of 2.9 percent for both the CPI-U and CPI-W. There are several reasons that older Americans faced slightly higher inflation rates over the past 29 years. First, older Americans devote a substantially larger share of their total budgets to medical care. The share of expenditures on medical care by the CPI-E population is roughly double that of either the CPI-U population or the CPI-W population. In addition, over the 1983–2011 period, medical care inflation increased significantly more than inflation for most other goods and services (5.1 percent annually for medical care, compared with 2.8 percent for all items less medical care). Second, older Americans spend relatively more on shelter, and during the last 29 years shelter costs have modestly outpaced overall inflation. 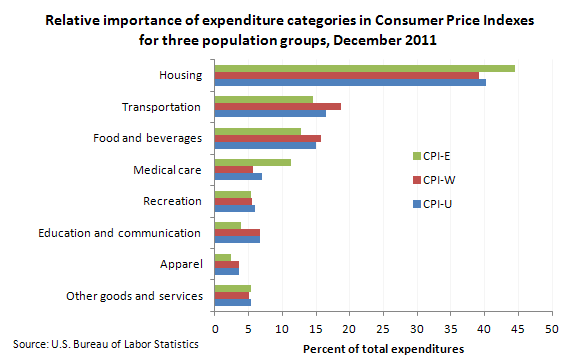 These data are from the Consumer Price Index program. Bureau of Labor Statistics, U.S. Department of Labor, The Economics Daily, Consumer Price Index for the elderly on the Internet at https://www.bls.gov/opub/ted/2012/ted_20120302.htm (visited April 18, 2019).